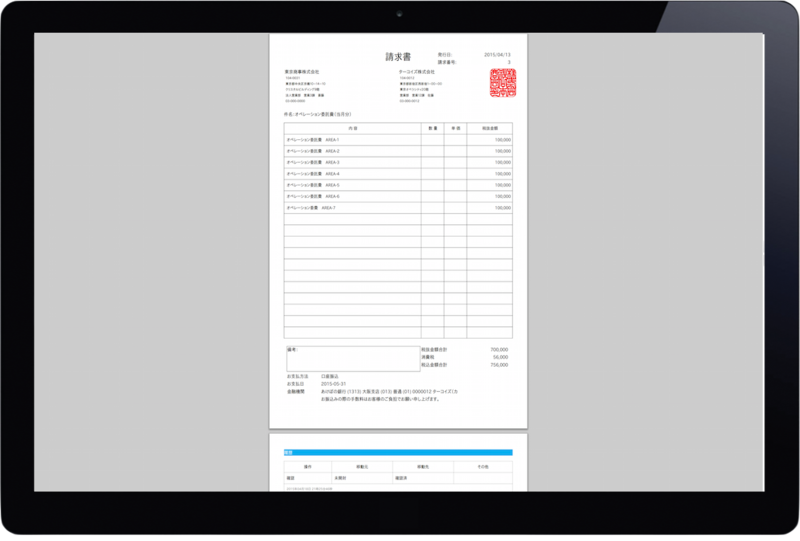 Bank Invoice | Hello, Paperless World. Bank Invoice will connect you with clients around the world. 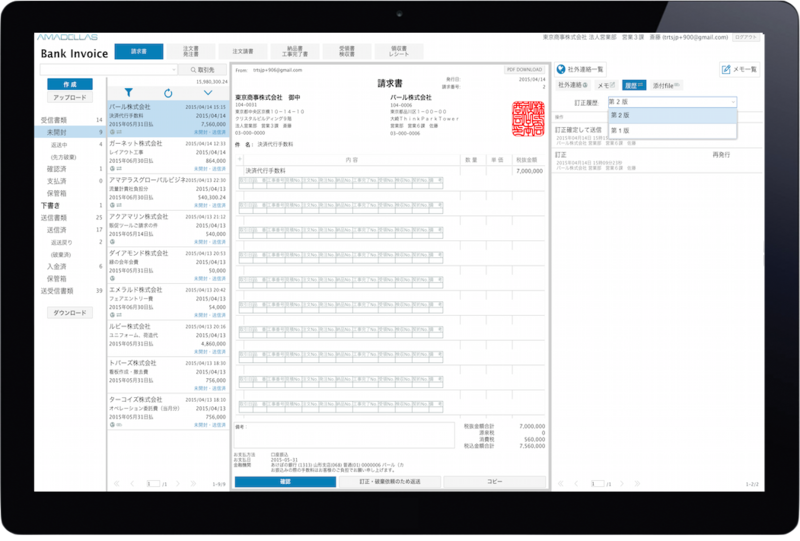 Bank Invoice will digitize original invoices and send and receive them just like e-mail. Since Bank Invoice will integrate every transaction with a client , so the accounting workload can be significantly reduced. With Bank Invoice, you can achieve paperless business instantly and easily. iOS/Android version which will soon be launched. I agree to the above, subscribe to Bank Invoice. Free of charge with no functional restrictions. Installation not required on either Windows or Mac. Bank Invoice is widely used by freelancers, venture companies and major companies. Simply complete the form as you would any spreadsheet software. This invoice can be used in every industry. The number of rows for items is limitless. User registration requires only an e-mail address and other information found on a business card for invoicing. You can send e-mail even to non-users (e-mail address required). User registration is required only for senders. Since receivers do not have to be registered, you can start using Bank Invoice right away without explaining the system to receivers. Receivers receive PDF files or original invoices via Bank Invoice and can output them as desired. If all processes of creation, transmission and receiving are conducted via Bank Invoice, you will not need any paper. In all electronic transactions, you will not have to create PDF files or electronic signatures. Moreover, since incoming invoices can be digitized, you will be able to use tablets even more. You can send electronic invoices to clients who require original invoices. The mechanism of this system is completely different from conventional e-mail exchanges with PDF attachments. The colors of the buttons above the invoice, information displayed after clicking the buttons. *Documents in your possession (Inbox) appear black, while documents not in your possession (Outbox) appear gray. Each invoice can be connected and managed to include inquiries, replies, notes, history and attached files. With Bank Invoice, you do not need to waste time and effort searching with more than one software application, including e-mail. As opposed to paper-based invoices, you will never lose invoices. Since the procedural status of the other party is displayed in real-time, you will know whether the other party has confirmed receipt. Bank Invoice, therefore, helps prevent late incoming/outgoing payments ahead of a bank transaction (prior to the date of bank transfer). Search by company name, invoice number, subject, description or Bank Name. Filtered invoice data can be downloaded. A tab on the upper right corner of the screen. 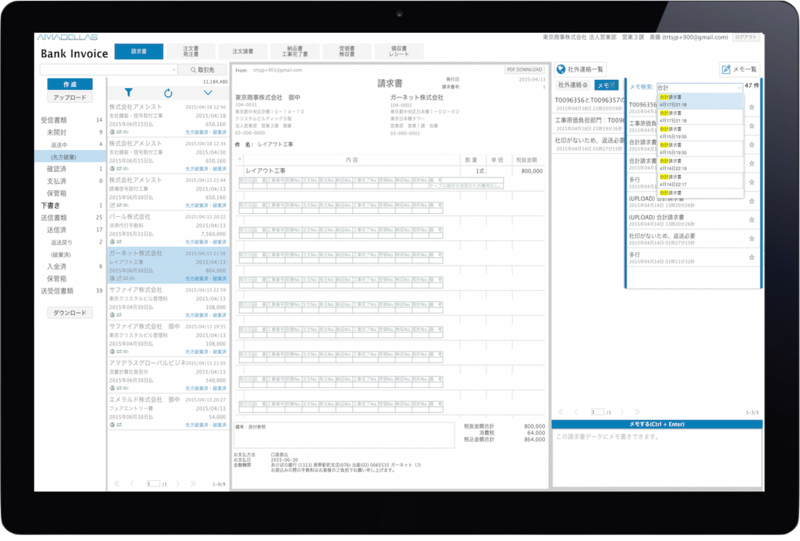 You can communicate with the contact person from the client company by invoice via Messages. You can view a list of Messages by invoice. Clicking an Messages link will open and connect the related invoice. You can add notes to each invoice data. 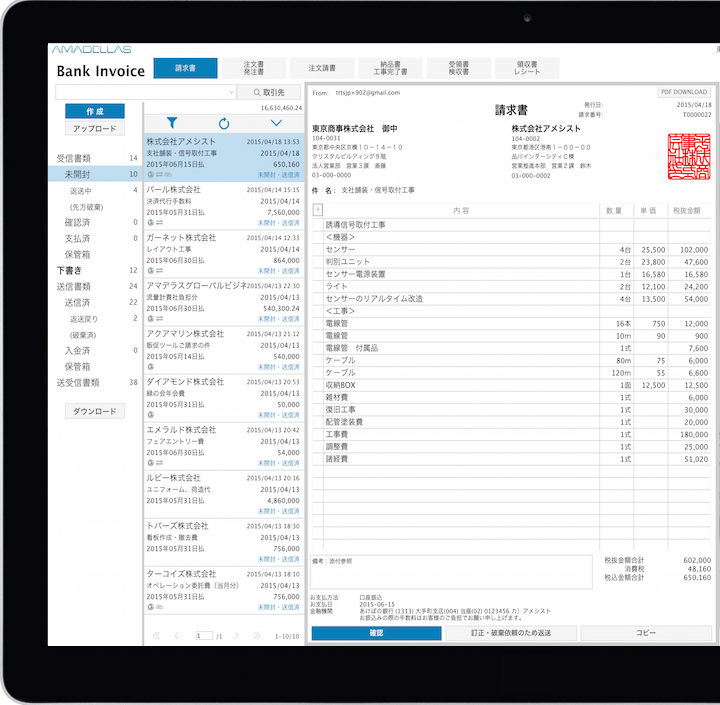 You can view a list of notes by invoice. Click the note to link to the related invoice. Records of everything from the transmission to storage of the invoice data. Original data and corrected data are linked to each other. You can view a list of attachments together with related invoices. 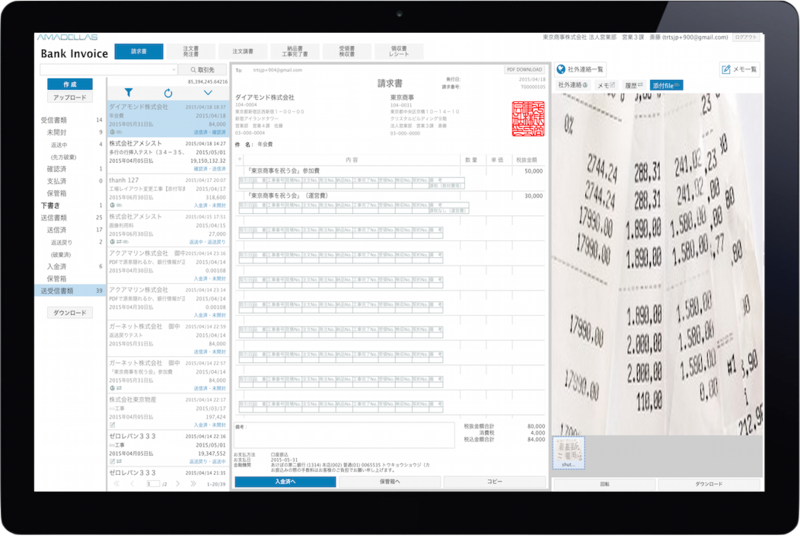 The size can be adjusted by moving the right edge of the invoice right and left. The printed invoice is the original. The entire history, Messages and notes can be printed at the same time. Click Create (on the upper left corner of the screen). you do not need to enter the company name or address of the recipient. Click the row for each item. Click Detailed Information (on the lower left corner of the pop-up for each item). Click the area around Total Amount without tax or Total Amount with tax. * The row for withholding tax can be hidden. Click the area around Payment Method or Bank Name. Click Upload (on the upper left corner of the screen). you can use it right away without explaining it to your clients. related to the mailing ofconfidential correspondence and long-term storage. and thereby promote informatization in business divisions that cater to the needs of the BYOD age. Since the mechanism is similar to those in widespread use by companies around the world through purchase systems, you can start transactions right away with other companies – including major corporations – around the world via Bank Invoice. Whether send one or several millions invoices per month, you can send and receive invoices on one screen. 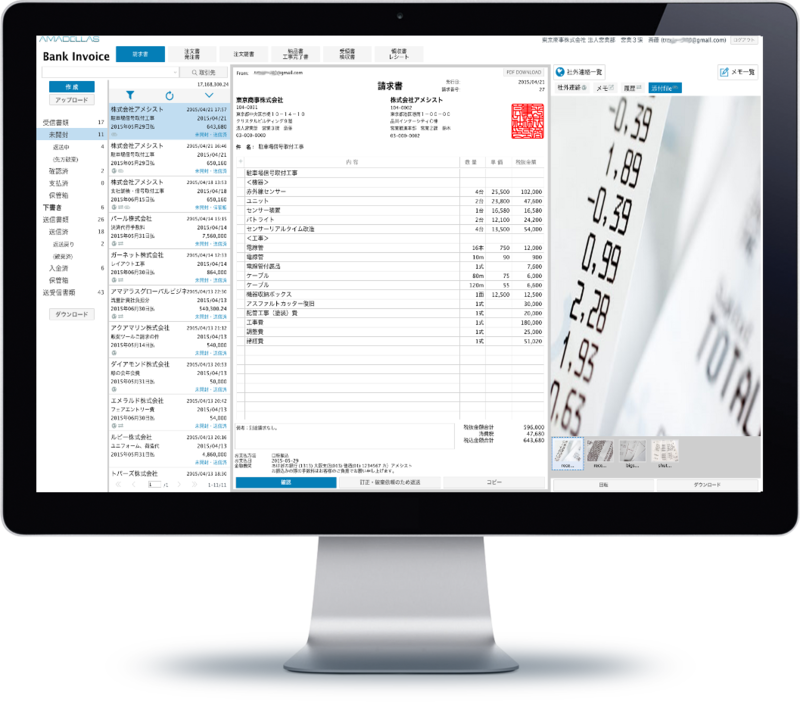 Several million invoices for a client can be indefinitely integrated into one invoice in real time. Not only does Bank Invoice not require cumbersome management of paper-based or PDF invoices, it also enhances traceability. There is no need for electronic signatures, time stamps or new additional operations for management. Since Bank Invoice is a two-way system, the entire operational history, including transmission/reception time and all operations of senders and recipients by invoice, is recorded and can be confirmed by both parties. The system lets you secure much greater probative force than conventional technology, such as electronic signatures, and proves helpful in tax inspections. Since the receiver is not allowed to correct or destroy received invoices, the recipient must send the invoice back to the creator (sender) for any corrections or revisions. After the creator has made the corrections, the original is destroyed. The corrected invoice connected to the original and can be viewed in History. Bank Invoice will connect bank transfer information to the invoice (international patent pending). both can exchange bank transfer information without involving the bank. everytime a payment is made and from creating and communicating about payment statements. such as virtual bank account services and the purchasing services of credit card companies. Progress in procedures taken by the other party can be seen. You can ensure good invoice management because the status of the invoice data changes to Sent as soon as the data is sent. When payments are received, the status is changed to Received. When invoices are received, the status is changed to Confirmed, and when payment is made, the status is changed to Paid. These processes are the same as for paper-based invoices. The procedural status of the other party can be seen in real time. For example, in the Sent folder of Outbox, the status changes to Confirmed when the other party confirms the documents and to Payment(Out) when the other party makes a payment. If you summarize all items in Payment(Out), you can get a detailed statement of Payments(In). Payments can be processed before the date of bank transfer. Through Messages, you can contact the person in charge at a client company by invoice. Since you can ask questions to or discuss a payment schedule directly with the other party, you will know the details of any bank transfer before the date of transfer and avoid discrepancies between the amount due and the amount transferred in advance. Without an accounting system, managing the dates of incoming and outgoing payments. Incoming and outgoing payment dates and bank account information are found on the invoice. In Inbox, the dates and amount of outgoing payments can be managed without an accounting system. In Outbox, the dates and amount of incoming payments can be managed through the status of the other party. Bank Invoice Corporation will continue focusing on going improvements while taking requests from users. Enter an e-mail address in the destination field and send. The original invoice can be sent in the same way as e-mail: you do not need to mail it. Since you can copy documents created in the past, you can create monthly invoices collectively without fail. Integrated data comprised of sales and costs can be downloaded. The information can be used for the creation of analysis materials and client management, as well as firm banking. 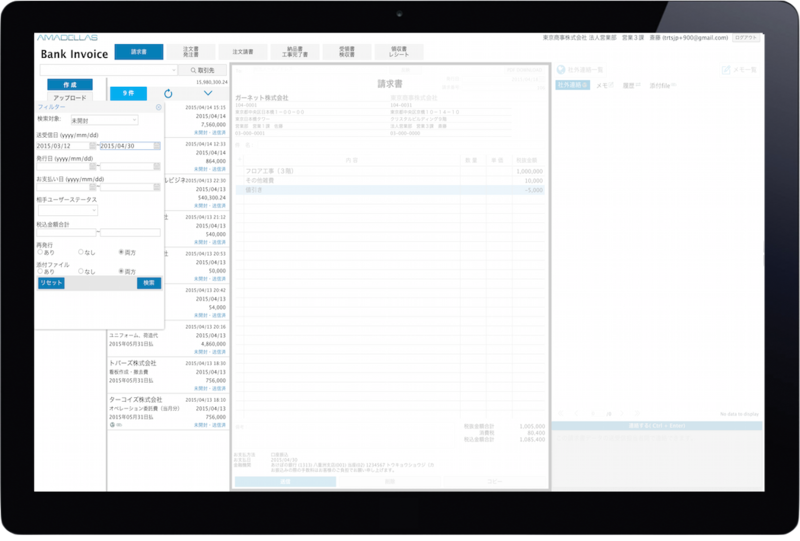 You can create multiple invoices at the same time. You can manage more than one client and claim the payment of the total amount. The total amount is automatically calculated. This is an e-mail function dedicated to each invoice. You can communicate with the other party in real time. Inquiries that were conducted by phone or separate e-mail software can be managed, listed and searched in relation to each invoice. This is a note function dedicated to each invoice. The function will manage, list and search notes, which were written on each paper-based invoice, in relation to each invoice. Notes can also be used as tags. This is the invoice history. It records all operations from the transmission by a sender to the receipt by a receiver and all subsequent operations. A corrected (retransmitted) invoice is connected to the original and can be cross-referred via a link. 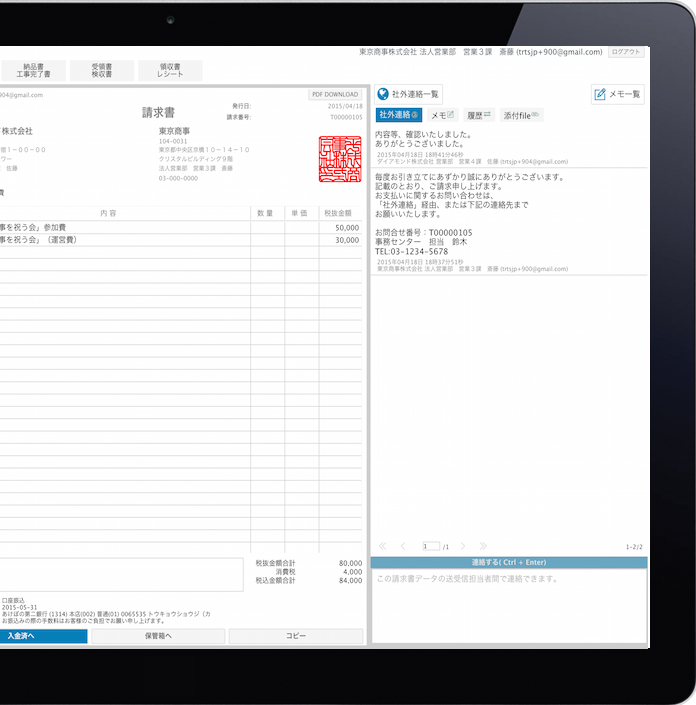 You can attach and send documents by each invoice. You can also manage invoice particulars and other materials, which were sent as attachments in the past, in relation to each invoice. Since no operational change is required, this function does not cause any extra burden on your clients. You can search for invoice data, outside communication and notes. Then, you can use the filter conditions, such as dates (period), amount, status of the client and reissued invoices, to download only the desired data. In principle, there are no restrictions on the number of characters for each entry, the number of rows in the invoice particulars and the number of bank accounts. 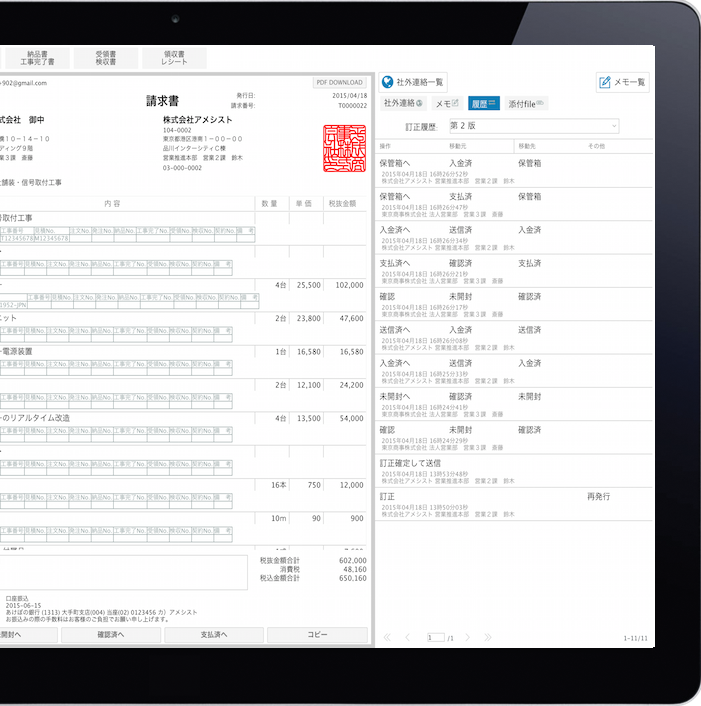 You can also connect detailed information about each invoice particular with a quotation number and manage them together. If you enter the Message form prior to transmission as you formerly would enclose a message with an invoice, you can confirm whether the other party has opened and read the message in the List of Messages. This function ensures that you make inquiries on an as-needed basis. We can customize Bank Invoice to cater to the needs of each client company, such as customization for a change in the invoice template, sharing and authority setting (Fee-based).